COLUMBIA, S.C. -- When Duke and UCF take the floor Sunday with a spot in the Sweet 16 on the line, the collision of storylines is going to be larger than life, and the magnitude of the matchup could not be better represented than the showdown of the building's two larger than life stars, Zion Williamson and Tacko Fall. Williamson's star shines the brightest but Fall is the star that literally is the largest. The 7-foot-6 center has worked hard on his health and fitness throughout his career to be in top shape for this tournament run, helping lead the Knights to their first NCAA Tournament appearance since 2005 and the program's first-ever NCAA Tournament win at the Division I level. In Friday night's win against VCU, Fall had 13 points, 18 rebounds and five blocks in 28 minutes of action. After the game, Fall made headlines with his declaration that he would not allow Zion to dunk on him, noting that he did not want to be a part of the highlight reel for a player who has become must-see TV for his frequency of highlight-worthy dunks. When given a chance to respond, Zion laughed at the idea of smack talk. "What was he supposed to say?" Williamson initially asked, while teammate R.J. Barrett rolled his eyes at the media's efforts to generate prize fight-like hype for Sunday's game. "He is a very unique player, and I got a lot of respect for him because for him to be that size and be able to move the way he does and have as much skill as he does, he's a great player," Wiliamson said on Saturday. "I think we're just going to have to come together as a team and figure out what we're going to do to try to stop him." 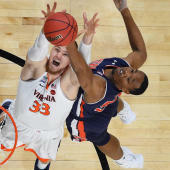 While Williamson has been a basketball prospect for much of his life, choosing the hardwood over football at a young age, Fall, on the other hand has only been playing basketball competitively for less than a decade. Both Duke coach Mike Krzyzewski and UCF coach Johnny Dawkins agree on one thing with their larger than life superstars: there's plenty of development left. Coach K has frequently returned to the idea that not only Zion but this entire freshman class -- R.J. Barrett, Cam Reddish, Tre Jones -- are in the infancy of becoming the fully-formed players and men they will be after they leave Duke. He takes the approach of conductor, trying to set each of them up in a position to succeed as a team while knowing the raw talent and potential might exceed the contributions during this pressure-packed season in pursuit of a championship. Dawkins won't commit to a particular pro future for Fall, but he is adamant that there is still an upside that has not yet been reached. "I hear the game has changed and his style of play no longer exists, but when you have a player like Tacko Fall with his personality, with who he is, in any community, he'll be one of the best people you'll ever have in the community," Dawkins said. "You want guys like that around. I know I would as a teammate or in that locker room. "I see him playing on the highest level. I don't know how and what path he's going to take, but at 7-6, 300, still has a huge upside in this game because he does. He's gotten even better this year. Throughout the season, I've seen improvement. I see him playing at the next level, and I think that's something he can accomplish because of his ability on and off the court." Zion of course has seen players close to Tacko's altitude, facing Florida State center Christ Koumadje twice this season. The Seminoles' center, at 7-4, 269 pounds, didn't get much of a look at Williamson in the first meeting because the Duke star left the game in the first half after getting poked in the eye. Williamson played all 40 minutes of the ACC Tournament championship against Florida State, but Koumadje played only nine minutes in that game -- it should be noted Koumadje averaged about 15 minutes per game this season -- scoring four points and grabbing three rebounds. "They're both big teams, but they play different styles, Krzyzewski said. "But I think it's helped playing against Koumadje, but Fall is stronger, bigger, and they go to him more, and he really just takes up the paint. He does a great job." The meeting of star bigs will have the nation tuning in, but both players were adamant in distancing themselves from the one-on-one hype given the stakes for both teams. There are more than two players on the court, but when contact is made between Zion and Fall at the rim on Sunday afternoon there will be at least a split second where everyone will hold their breath in anticipation for the result. Duke plays UCF at 5:15 p.m. ET on Sunday on CBS, with the winner advancing to Washington, D.C. for the East Regional semifinals next week.